We provide California CA | Graphic Design Services | 3D Modeling Rendering Designs for over 30 years now. Looking for a Graphic Designer and 3D modeling designs in Sacramento, Los Angeles, San Diego, San Jose, San Francisco, or Fresno CA Look to Capital Exhibits and see how our professional staff can work with you on improving your brand recognition by creating the right graphic design investment for your business in California CA. 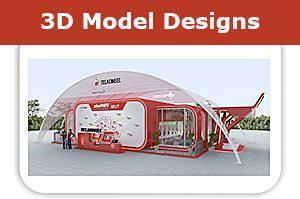 We have staff of 3d model designers who can help you get your next marketing project done in matter of days. We also provide large format printing services for clients in CAAsk about creative design services for your print designs need for trade shows, brochures, books, flyers and more. We can get your 3D rendering design or print designs done in matter of days with the highest quality using the colors you are looking for, clip arts, photos and professionally done. With the proper graphic design images & advertising your company can experience improved sales and brand recognition. Ourgraphic art design services are the perfect investment regardless of your industry; the ROI will speak for itself. Our products include some of the latest techniques, including QR codes. This is the easiest way to connect to your clients through the use of their smartphones using a display from Capital Exhibits. Capital Exhibits has everything you could possibly need when it comes to graphic design. From our graphic design business card services, brochure design work, trade show displays, or even tee shirt ideas. Try our trade show booth concepts and see the difference it makes at the next exhibition or trade fair you participate in. 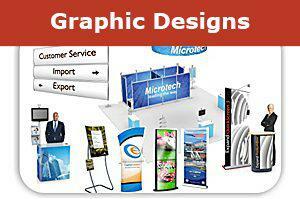 Try a table top display, tension fabric display, kiosk, or banner to catch the eye of your next customer. Have brochures and business cards ready to handout, all with a professionally designed logo from one of Capital Exhibit’s expert graphic designers. We know investments take a lot of planning and budgeting, so we will work with your individual needs and price range. For all logo design prices, 3D modeling rendering, print design pricing, and all other graphic design quotes & rates go to Request A Quote page and send us your next project. Capital Exhibits Is Committed to You Our team believes in our company motto: We build your best image. We specialize in branding design, meaning that we use graphic design ideas and products to boost your company’s brand recognition and brand equity. Our products will get to you on time and are easy to assemble. Many of our customers return to us year after year. Getting in touch with us is easy! Simply call at (866) 730-3746 or email us at [email protected] . We look forward to hearing from you!